The city council of Aranda del Duero joins the Spanish cities that install parking sensors in their desire to become smart cities. The local council seeks to improve mobility with this innovative technology, based on reducing by 30% the traffic that is estimated to circulate in the center of the city in search of parking spaces. This ambitious Smart Cities project was included in the renovation of the regulated on-street parking management (allocated to the operator EYSA), with a clear objective of reducing pollution and driver discomfort, as well as to boost local commerce through improved mobility in the center. The concessionaire commissioned the integration of the project to Dinycon, an engineering company specialized in mobility solutions, who in turn chose Urbiotica’s technology as the basis of the data collection that today feeds the entire system implemented. Dinycon commissioned Urbiotica with the 272 U-Spot sensors needed to install in the parking spaces of the regulated parking area with the mission of sending data in real time to the system of variable message signs and applications for users and managers, provided by the integrator. The data captured by the sensors is transformed into useful information to transmit the availability of free spaces in strategic points of the city, so that the driver can go directly to the area with parking possibilities. According to Roberto Garcia: “The system works well. The panels transmit information accurately and you can see an improvement in traffic in the center and a better efficiency in the use of parking spaces. This new system has clear benefits for the citizen. The streamlining of parking translates into a better experience for users being able to move quicker and more comfortably to the area, involving less stress and lower fuel consumption. In addition, it means an improvement for their health, both in terms of the reduction in the pollution generated by vehicle emissions as in the noise caused by excessive traffic. On the other hand, managers are able to have real-time data on mobility in the area that allows them to plan and define improvement plans. It optimises the use of parking spaces and has greater control over the regulated zone. The citizens are satisfied with the improvements implemented, as well as the local commerce that sees the results in an increase in the affluence. “The city council is delighted with the system and satisfied because it represents a technological deployment that positions Aranda as a pioneering smart city in the region. For Eysa the deployment of the system is also positive. The concessionaire of the regulated parking area confirms that they have noticed improvements and the parking areas are being used much more. With this project they see an increase in the use of the parking area and therefore they see an improvement in the results and an economic benefit of the exploitation. The new MWC 2019 focus turns Urbiotica into a key player: Connectivity, Big Data and A.I. Mobile World Congress is coming once again this year to Barcelona, from the 25 to 28th of February. Along with it comes its load of futuristic news and predictions concerning the mobile technologies. However, this year’s edition is expanding its reach beyond ‘just’ mobile by focusing on 5G as expected, but also including as main protagonists the Internet of Things (IoT), Big Data and Artificial Intelligence (AI). This natural evolution resulted in a rebranding of the event (MWC) to better reflect this widen scope. Connectivity: to connect reliably wireless and autonomous sensors to our sophisticated platform, with the emergence of the NB-IoT protocol to simplify deployments and address new use cases. Big Data: the platform concentrates most of the intelligence of the systems. It’s where billions of raw measurements sent by the sensors are processed to generate the useful information used by our customers and the people living and working in these cities. Artificial Intelligence: although it’s more a challenge to come than a real insight in the actual structure of the solutions, Urbioticas’ vision and experience based on customers’ feedback is leading right there. Beyond the pure sectorial predictions expected through any IoT solution based on historical data and to help decision-making and planning, how can we let A.I. mechanisms define and execute daily tasks impacting on people mobility and well-being? Where do manager knowledge and user behavior stand in the amount of data collected, processed, and crossed with external sources of information? If in an industrial and controlled environment huge progress has been made in that way, in the Smart City sector, where external inputs of the system are so various as unpredictable, this step forward seems still quite far away. Most of our customers, especially in the public sector, are still learning to use the new insight represented by a reliable source of continuous information provided by the IoT system. On one hand, they are making the most of the real-time benefit offered by guidance and alerting messages, and on the other, they are beginning to integrate to their mid and long-term strategic planning information brought by the analytics offered by the platform. This is where we stand right now, not really due to a lack of technologies, but because of a progressive approach where each step is important in the learning curve. Next one will be conditioned by the will of the cities’ managers to improve their interaction capacity with the system, to influence on people behavior according to the situation and rules they have configured. Once this is fully controlled on a project basis and the patterns are perfectly understood, then will be the time for artificial intelligence. Are you planning to be around and want to talk with our experts? Please send us an email to set a meeting at info@urbiotica.com. Lugo is committed to becoming a Smart City in a macro project promoted by the Galician town council that aims to transform the town by setting different objectives, such as improving the quality of life of the inhabitants and the efficiency of public services and promote the participation and transparency for citizens through new channels of information collection and dissemination. Lugo Smart has the backing of RED.es, which finances 60% of the 4.1M euros that this project represents. A joint venture has been created as a technological partner of Lugo City Council, in which Minsait (Indra), R Cable and Altia participate in an alliance. Smart management of outdoor parking spaces and waste collection are some of the vertical services that will be developed. 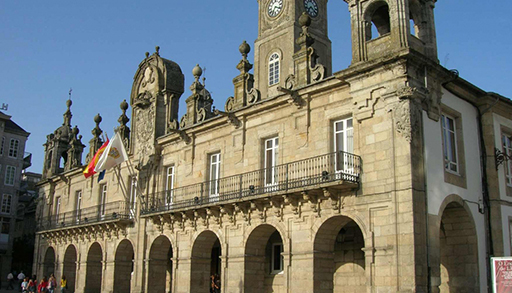 Through the integrator Colabora, 200 Urbiotica U-Spot sensors will be installed in the outdoor parking spaces of the Rúa Doutor García Portela area, as well as in the public parking of the Lugo City Council offices. This solution will detect the presence or not of vehicles in each of the spots. This information will be used to transmit to citizens in real time the parking space availability in these areas through 2 information panels that will have solar power. The project also contemplates the development of an app for citizens through which users will also be able to consult the status in real time. This solution will reduce the time spent by vehicles searching for a place to park and, consequently, congestion and polluting emissions. Lugo joins the pack of smart cities that have opted for the reliability of the Urbiotica system for outdoor parkings to improve the mobility and well-being of their inhabitants. Badajoz, Palamós, Alzira, Calvià, Aranda del Duero or Guadalajara, among many other Spanish cities, have done the same before. 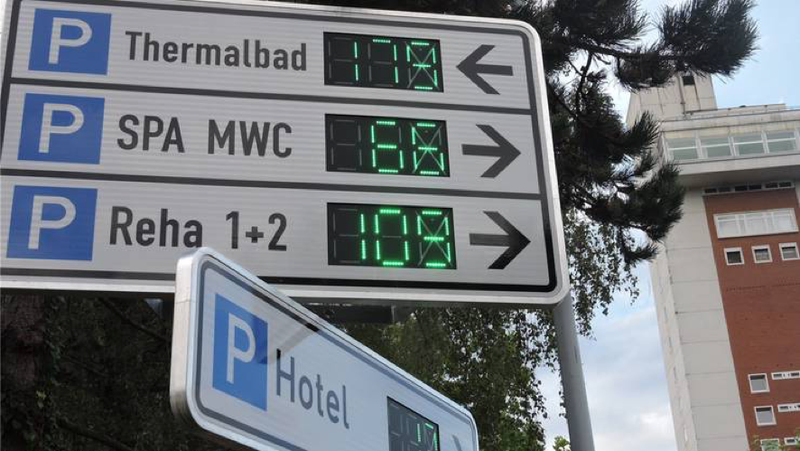 Urbiotica’s Outdoor Parking sensing system keeps its first place with regards to the outdoor Smart Parking technologies used in Germany, thanks to the new projects deployed there during 2018 by means of our partner and distributor in the area, MSR-Traffic. A dozen of new projects for both public (cities) and private customers (companies and supermarkets) were installed in 2018, summing up a total of 10.000 outdoor spaces monitored in the region (Germany, Austria, and Switzerland) since 2013. Among them, cities like Erfurt, Dingolfing, and Pfaffenhofen have made a step forward to their Smart City goals through the acquisition of outdoor guidance systems based on U-Spot single space detections and U-Flow counting solutions. Today they deliver real-time parking information to drivers, which facilitate the search for free parking spots and thus improve the mobility experience and citizen satisfaction. Urbiotica’ solutions for outdoor vehicle detection are the ideal complement to MSR-Traffic core products, which include indoor detection sensors, guidance VMS and parking management software. The strengths of the integrated solution offered, covering all parking guidance needs, haven’t been overcome yet. Another good example of both technical and functional complementarity of the partnership is the project of Bad Zurzach, the famous Swiss thermal station where citizens, visitors, and public authorities were very unsatisfied because of the lack of parking information which was resulting in traffic congestions, loss of time, stress and forbidden parking in the area. The system implemented by MSR-Traffic composed of single space detection sensors and Variable Message Signs has greatly helped to improve the situation and now is giving full relief and well-being to the thermal site owner. 2019 is already shaping up to be excellent for the partnership thanks to the confirmation of several new customers, as well as extensions of existing projects. Keep posted! 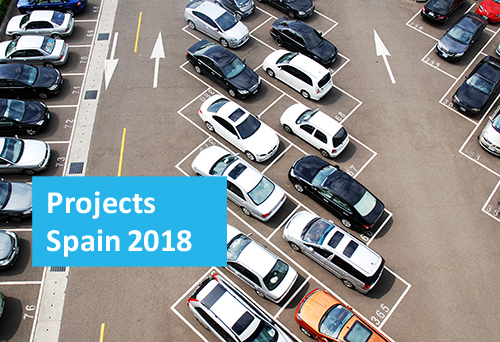 Urbioticas’ 2018 smart parking projects in Spain. Spain is massively adopting Smart Parking systems to enhance the drivers’ journey into towns’ city centers. In 2018, many parking operators and cities have invested in outdoor guidance solutions to help people reduce the time looking for a free spot. Badajoz, Palamos, Alzira, Aranda del Duero or Guadalajara are examples of cities that have decided to modernize their parking approach through the deployment of U-Spot single space parking sensors for on-street spaces and efficient Variable Message Signs to deliver real-time parking information to drivers and thus improve the mobility experience and citizen satisfaction. Besides the evident direct benefit for the citizens, the mobility decision-makers also make the most of the detailed and reliable historical information delivered by the U-Admin Control Center. It allows them to define further parking policies based on parking occupancy, amount of rotations and average sessions time evolutions. Moreover than surfing on the Smart City wave, the consolidation of Urbiotica in the Spanish market is given thanks to the increased confidence of both cities and system integrators in its parking solutions. This is due to years of developments delivering optimal detection reliability, system robustness, and a unique end-to-end approach from the sensing to the information publishing, with no extra developments required. A long experience handing the end customers the key to manage their own outdoor parking guidance systems in an easy way. 2019 is beginning on the right foot with some new ambitious deployments already confirmed by cities such as Las Palmas, Alcala de Henares, Valencia or Lugo. These projects will also allow Urbiotica to deliver key improvements and add new use cases of which we will surely inform you all along the year! Magnetic sensors or loops to monitor and inform on the availability of parking spaces in off-street parking areas? The solution to monitor off-street parking designed by Urbiotica offers an efficient and highly reliable way to obtain availability in delimited facilities with clear entrances and exits. The system calculates the available spaces based on the maximum capacity of the facility with respect to the vehicles entering and leaving the parking area. The parking solution uses magnetic sensors, which generate useful information to guide drivers through mobile apps and VMS in their key decision-making points towards these areas and alleviate traffic in city centers. Full compatibility to work in combination with U-Spot single space detection sensor for reserved space monitoring, among others. U-Flow Parking is already used by public and private parking today in more than 10 countries. Therefore, it’s helping drivers, employees and commercial area customers reduce the time looking for a parking space and thus the associated traffic, contamination and user frustration. 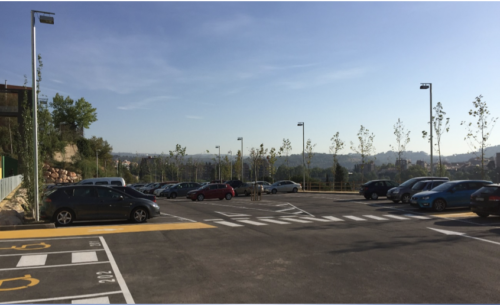 “We realized that we had to indicate the availability of parking spaces to the users of the new hospital parking area. It is hidden beneath the building and barely had any visibility from the street. I studied the different market options and ended choosing U-Flow parking solution. Our library’s off-street parking and our barrier system are also connected to the platform informatically. I manage everything from a single web page. Urbiotica will be present at the Smart City Expo World Congress 2018 in Barcelona from 13th to 15th of November, and once again join the theme “creating together cities to live in”. We will be presenting the latest news and projects about parking management and noise monitoring solutions. -Installation of counting sensors at the entrances and exits of the park & ride areas of several cities in Belgium to monitor and inform users in real time of the availability of free parking spaces and thus reduce traffic while improving user satisfaction. -Deployment of parking guidance solutions, which guide vehicles to the available free spaces, as is the case in the City of Rosario (Argentina) in a project of 1,000 parking spaces or in tourist cities in Spain such as Calvià (Mallorca). It significantly reduces the number of vehicles circulating in search of parking and improves mobility in the area as well as the satisfaction of its citizens. Implantations by means of counting sensors or spot to spot sensors or even the combination of both as in Burlington (Canada), carried out without the need to remove the parked vehicles or interruptions in the service to the citizens. -Control of loading and unloading areas. Teruel (Spain) is one of the projects to highlight where today the local police is informed in real time of the use and thus improves efficiency in the management of the area. -Solutions to obtain real measures of noise levels, 24 hours a day, all week. An example is the Alicante project implemented with the aim of resolving conflicts, assessing compliance of the defined noise levels, evaluating the efficiency of the actions implemented and transparency with the citizens. We have made our contribution to “creating together cities to live in”. Shall we tell you about it? More than 3300 U-Spot sensors prepared for the Smart City project in Las Palmas de Gran Canaria. Las Palmas de Gran Canaria is making good progress towards sustainable mobility within the framework of a large Smart City project promoted by the City Council and Red.es. Urbiotica has been selected by UTE INDRA – SATOCAN to collaborate in the Smart parking vertical of this macro project of the technological revolution of the island: LPA intelligence Blue. LPA Inteligencia Azul plans to implement several innovative actions, including the intelligent management of public parking spaces. For this action, the municipal company SAGULPA, as responsible for the management of municipal car parks (regulated and public areas), will implement more than 3300 U-Spot sensors in the parking area, which will capture real-time information on the occupation of spaces. This data will allow users to be informed of the availability of parking in the different areas through the information panels and by using the LPAPark APP. On the other hand, they will provide the parking management company with data related to the real use of the parking spaces in order to optimize their management and the efficiency of the car park. – Sensing as a Service approach that allows the system to be installed without the need to remove parked vehicles or interrupt service to citizens. – Guaranteed calibration of sensors over time without human intervention. Belgium is one of the densest countries in Europe and has an exceptional architectural heritage to protect with beautiful city centers. The Belgian capital, for example, was renowned for gridlock and every day 225.000 people commuted into the city spending an average of 3 days and 11 hours a year stuck in traffic. Therefore, decision-makers’ years ago adopted and developed P+R (park & ride) solutions to offer an effective multimodality solution for drivers coming from the outskirts and willing to access the city centers. To promote these wide, free and barrierless facilities, an increasing number of cities chose U-Flow Parking solution to monitor the parking availability in real time by using counting sensors at the parking entrances and exits, and thus inform it to drivers through mobile apps and VMS in their key decision-making points. 5 cities and one shopping center are already using the solution on a daily basis. They indicate the free space options and help drivers take the right mobility decision. In total, more than 10 parking facilities are making the most of the simplicity and completeness of the solution. The real-time information, once transformed in historical data analytics, also helps the mobility managers and city planners study in detail the use of each parking: vehicles flow at peak hours, occupancy overtime, special events use, are some of the key information making possible the analysis of past and current situation to decide better where and when investments are required. All projects have been deployed and integrated by Be-Mobile, the belgian leader for smart mobility solutions. Urbiotica will be present at the next annual parking conference (CPA) taking place next September 16th in Toronto to support its new partner in Canada, Electromega, in the exhibition of its smart parking solutions. CPA is the largest parking event in Canada. It brings together professionals from a broad spectrum of the parking and mobility industry using the topic: Parking, the urban mobility perspective. Electromega, as market leader in the definition and implementation of smart solutions for parking vehicles, opted for our technology to complete its range of parking products. The integrator has already achieved great results in the first projects implemented, as is the case of the city of Burlington or other pilots installed in Ontario and Quebec, where the technology has once again demonstrated its reliability operating in very extreme weather conditions. Urbiotica will be attending the ITS World Congress 2018, the largest international congress for intelligent transport Systems (ITS) in Copenhagen from the 17th to the 21st of September. ITS solutions provide the answer to some of the world’s most pressing and topical challenges, such as climate change, air quality, urbanization, congestion and traffic safety. The congress will have a large exhibition area of 25000 square meters and expects to see some 10,000 attendees and 400 exhibitors. After San Fernando de Henares (Madrid) and El Prat (Barcelona), Amazon Fulfillment Center selected Urbiotica again to deploy the parking guidance system for its new facility in Illescas (Toledo). Satisfied by the previous experiences the company decided to propose a similar experience to its employees in Toledo, reinforcing its image of a cutting-edge company at first sight. Thanks to the real-time availability information provided, drivers will be guided dynamically to one of the 2 parking areas offered by the site, in order to smooth the traffic flow at peak hour and ease the arrival of the vehicles. 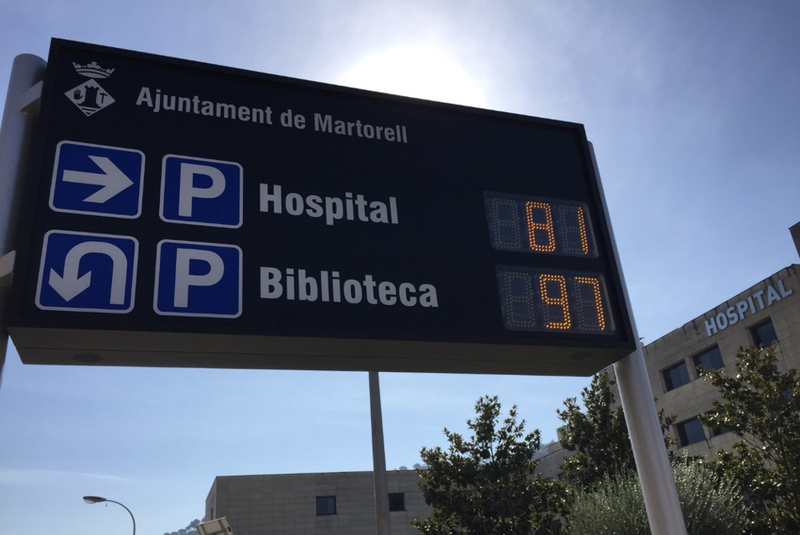 Two impressive ITINERE Variable Message signs will display the parking information collected by Urbiotica’s U-Flow Parking system deployed, which will be counting all vehicles entering and exiting the areas and communicating it to the U-Admin cloud platform. From now on Urbiotica through a recent partnership, offers customers a free multi platform (iOS, Android, Windows phone) mobile application to complete its parking guidance system. The mobile application eases the search of free parking spots, allowing the drivers to better plan their trip in advance by consulting the parking availability from their departure point. In addition to indoor and outdoor parking availability, the app also delivers key information for the users: prices, regulation and opening periods of the parking facilities, among others. The same parking information is also available on a public website and through different navigation channels (as built-in and autonomous GPS systems), maximizing this way the diffusion of the information to all people driving to destinations near the parking options. 6 customers have already adopted the app to complete their parking solutions in Spain, Germany , Malta and Argentina. Urbiotica expects to have some 20 cities connected by the end of the year. 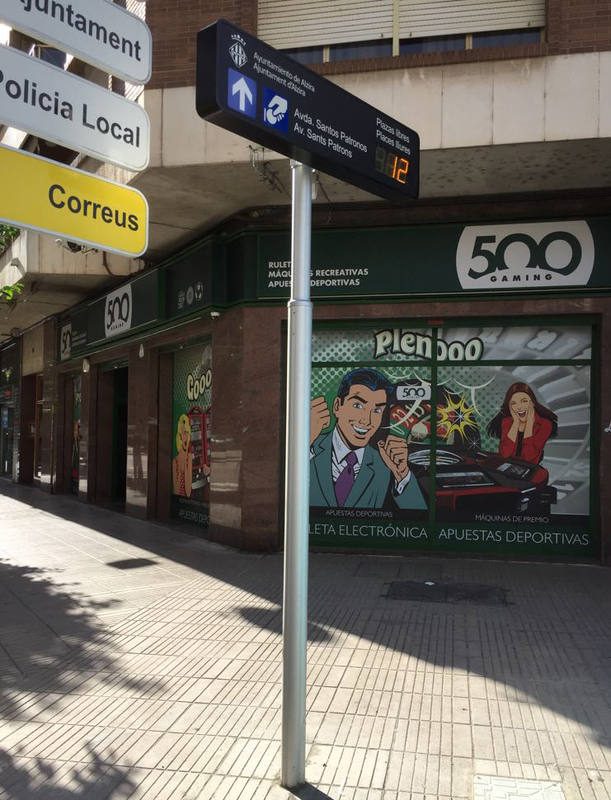 Rosario Municipality (Santa Fe, Argentina), adds IoT solutions at the service of citizens: 1000 sensorized parking spots to improve mobility at the city center. Rosario is the largest city in the province of Santa Fe and the third most populous city in the country. As is common in most of huge overpopulated cities, citizens support day-to-day annoying and endless traffic jams. In this specific case at Rosario’s city center, public parking spaces are a scarce. Great part of the bottlenecks are caused by vehicles searching for a free spot to park. Tránsito Rosario, as the city concession parking holder, aimed to add IoT solutions at the service of the citizens. Our local partner Gradicom deployed our Smart parking guidance solution for them through which cars are guided directly to the free spots to consequently reduce the vehicles driving around and therefore improve mobility and the citizen life quality. The project began with a pilot covering 10 parking spaces. After verifying the right functioning of the system as well as its good results during this period, we are about to implement the second phase which will embrace 1000 sensorized parking spots. Want to know more about Urbiotica? Like some information about other smart parking projects? After several months working on the development of the U-Spot M2M, Urbiotica enters the final validation phase with the installation of the first prototypes in Barcelona. The U-Spot M2M will be based on the new telecom industry-driven NB-IoT standard and will enable direct sensor-to-cloud communication without the need to install dedicated gateways. Consequently, the installation and subsequent operation of projects will be greatly simplified and the total cost for the Client will be reduced. The U-Spot M2M will expand Urbiotica’s range of parking products to address a broad segment of customers who need to manage reserved parking spaces such as PRM or Loading zones, which is one of the cities’ biggest headaches. These kinds of places are scattered, among others, complicating the installations from an economic and operational point of view by having to implement solutions with dedicated gateways. According to Marc Boher, Urbiotica’s CCO, “Customers today expect much more than a reliable vehicle detection solution, they need a comprehensive solution that meets their management needs. In the last 2 years we have been focused on the development of a global guidance solution for urban environments that has allowed us to be positioned as leaders in this market segment.” As a complement to the new sensor U-Spot M2M, Urbiotica is working on a complete solution for the management of PRM and Loading parking spaces based on the experience acquired in the execution of these kind of projects. The next steps towards a 100% market-ready M2M solution is to complete the validation phase and depends on the commercial launch of NB-IoT services by mobile operators. “Urbiotica is really satisfied with the first results and expects to be able to supply the first commercial units by the end of the year. The team works very actively with operators from several countries to make it happen very soon” concludes Josep Mª Torras. Urbiotica will exhibit at the Intertraffic Amsterdam 2018 fair from the 20th to 23rd of march, in the Smart Mobility Hall. During the event the company will present the recently announced U-Spot M2M with NB-IoT communication, with which Urbiotica completes its Smart parking product range. The fair will also be the opportunity to show the over 30.000 entrepreneurs and professionals of the sector joining the event its fully integrated solutions for parking guidance and control: wireless magnetic sensors for single space detection and vehicle counting, dynamic message signs as well as software tools to manage the system and control the use of regulated parking spots. Regarding the control, the new M2M version of the U-Spot is a great step forward in terms of cost reduction and agility of the deployments. It especially opens a new way to monitor isolated spots, such as the reserved ones for persons with reduced mobility and loading areas, a major issue for the cities when talking about mobility. On the other hand, this new product will offer Urbiotica’s international partners great flexibility in project implementation, being a single product compatible worldwide. Pass by our booth 08.210 at Smart Mobility Hall or book a meeting now with our experts by sending an email to info@urbiotica.com with the name of your Company, your contact details and when you would like to come around. We will be delighted to meet you! To access the event, you can register and get your pass for free here. Urbiotica will be attending the 7th edition of the Smart City Expo World Congress in Barcelona, from the 14th to 16th of November 2017 in the Gran Fira venue. Through the presentation and live demos of its Smart Parking and Continuous Noise Monitoring solutions, Urbiotica will showcase how it is transforming mobility and wellbeing in Cities all around the world thanks to the latest generation of IoT technologies. To learn more, come and visit us: Hall 2, Street F, booth 613. Book your own meeting by writing us at info@urbiotica.com. Urbiotica will this year also join the GSMA at the 4YFN Village to present the latest developments carried out with mobile operators: booth 4YFN B7. The Smart City Expo World Congress is the worldwide leading event for the smart city industry. A place to tackle urban challenges and share solutions towards becoming a more livable and sustainable society. Urbiotica will be attending the ITS World Congress 2017 in the Palais des Congrès of Montréal from October 29th to November 2nd. The ITS World Congress 2017, produced by ITS America in conjunction with ITS Canada and co-organized by ITS Europe and ITS Asia-Pacific, brings together global leaders in intelligent and transformative transportation to showcase and evaluate the latest innovative concepts, active prototypes, and live systems. Urbiotica will be part of the eleven Catalonian companies and tech centres showcasing at booth 829/831, and will also be represented by its local partner and distributor PTP at booth 1923. PTP will be demonstrating the Internet of Things space detection system already deployed in Burlington (Ontario, Canada). Urbiotica announces the deployment 2 new major Smart Parking projects in Canada and Malta. The City of Burlington (Ontario, Canada) has recently selected Urbiotica and PTP to deploy the Smart Parking System in the city center. Burlington has been seduced by the performance of the new Long Range U-Spot 2.0 parking sensor as well as the flexibility offered by the U-Flow counting sensor for off-street parking. In total, 450 on-street parking spots and 12 off-street parking will be monitored in real time to help drivers find free spots quicker and reinforce control operations to improve the mobility. The 1st phase of the deployment is already operational in Locust Elgin Street. PTP has also successfully passed Urbiotica Certified Partners program and will be distributing the solution in Canada. They will be presenting the solutions this fall during the next ITS World Congress in Montreal. The City of Ħal Qormi (Malta) has also decided to trust Urbiotica and Infracore for its Smart Parking guidance system. The 1st phase of the project, concentrated in the city center, will be operational this summer. 125 parking spaces will be monitored with our U-Spot sensor to display in real time parking availability in each street, through variable message signs and a mobile application. Infracore has also successfully passed Urbiotica Certified Partners program and will be distributing the solution in Malta. 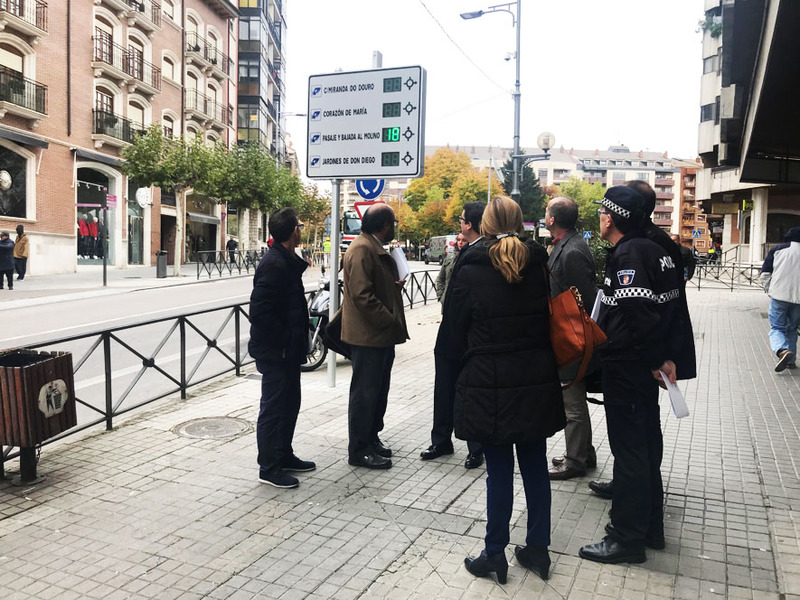 The Department for Noise Pollution Reduction of Barcelona City Hall has recently successfully tested the Urbiotica U-Sound noise sensor over the requirements for noise sensors to be installed in the city. The Urbiotica U-Sound is an autonomous and wireless acoustic sensor designed to measure noise in the city. It makes continuous measurements and every minute, it sends a new equivalent continuous sound level value through the communication network. From the data captured by the sensor, it is possible to generate other indicators and alerts for exceeding the previously defined noise levels. The quality of the sensor’s measurement is equivalent to a Class II sound level meter. Being Sentilo-compatible means it is virtually “plug and play” with the Sentilo data platform.